ROSEAU – A member of the Opposition United Workers Party (UWP) in Dominica is considering legal action after being questioned by police over an alleged coup attempt. Dr Thomson Fontaine was taken into custody on Sunday afternoon as he was leaving a local radio station, five days after unrest in the capital, Roseau, that followed an opposition meeting at which calls were made for Prime Minister Roosevelt Skerrit and his entire Cabinet to resign. “…I was surrounded by five armed men dressed in army fatigues who identified themselves as police, grabbed my phone and bundled me into a waiting van,” Fontaine wrote on his Facebook page. “I was told that I was arrested on suspicion of inciting violence related to an opposition meeting on Tuesday,” he added, noting that he was interviewed for approximately three hours “surrounding my involvement in a planned coup to overthrow Skerrit”, before being released and told to return to the station the next day 9 a.m. for more questioning. However, after further interrogation yesterday, he was released in the afternoon without charge. A day after the unrest in the capital that resulted in businesses being looted, fires being set and other acts of violence, Prime Minister Skerrit had told the nation that police were been informed about a plan by the opposition to carry out a coup that day. Dr Fontaine, an economist, said he was accused of being involved in such an alleged plot and that he faced “ludicrous charges” in his interview with police. “…Some of which included, for example, that I, Thomson Fontaine, paid individuals to stone the buildings on Tuesday and to set fire to a building …Charges that I find to be preposterous. I wasn’t prepared to answer to any of those charges, so I maintained my silence, the interview continued and at the end of the interview I basically waited until I was told that I was free to go,” he said. 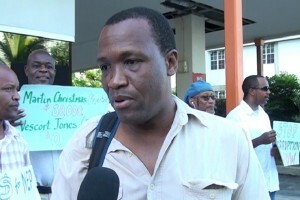 When Fontaine was questioned on Sunday and yesterday, supporters gathered outside the police station calling for his release and reiterating their calls for Prime Minister Skerrit to step down.